Teleperformance (Paris:RCF), the worldwide leader in omnichannel customer experience management, today announced the company was recognized as a Leader by the Everest Group in the Contact Center Outsourcing (CCO) – Service Provider Landscape with PEAK Matrix™ Assessment 2017. This marks the fifth consecutive year Teleperformance has received these honors from this distinguished independent consulting and research firm. Everest Group classifies 35+ CCO service providers on the Everest Group PEAK Matrix into three categories of Leaders, Major Contenders and Aspirants. The matrix is a framework to assess the relative market success and overall capability of service providers. 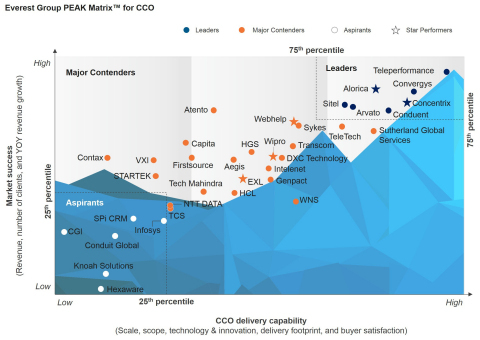 On the PEAK Matrix for CCO (matrix above) Teleperformance achieved the highest possible scores and positioning of all companies evaluated on both market success and CCO delivery capability. Buyers cite some of Teleperformance’s key strengths as being process-driven, consistency and flexibility. Daniel Julien, Executive Chairman, and Paulo César Salles Vasques, Chief Executive Officer, Teleperformance Group, said: “We are grateful to Everest for their thoughtful mapping of the contact center outsourcing industry. Receiving the top ranking position is a reflection of our global leadership and the ability to passionately serve Global, Glo-cal, and local companies. Over the last 40 years, Teleperformance has become “The Personal link” between brands and their customers all over the world, and we are deeply committed to continuing to deliver an outstanding customer experience to our clients”. A complimentary preview of the Everest Group Contact Center Outsourcing (CCO) – Service Provider Landscape with PEAK Matrix™ Assessment 2017 can be found here. Teleperformance (RCF - ISIN: FR0000051807 - Reuters: ROCH.PA - Bloomberg: RCF FP), the worldwide leader in outsourced omnichannel customer experience management, serves companies and administrations around the world, with customer care, technical support, customer acquisition (Core Services), as well as with online interpreting solutions, visa application management services, data analysis and debt collection programs (Specialized Services). In 2016, Teleperformance reported consolidated revenue of €3,649 million (US$4,050 million, based on €1 = $1.11). Teleperformance shares are traded on the Euronext Paris market, Compartment A, and are eligible for the deferred settlement service. They are included in the following indices: STOXX 600, SBF 120, CAC Support Services, and from September 18th, 2017 the CAC Large 60 and CAC Next 20. They also have been included in the Euronext Vigeo Eurozone 120 index since December 2015, with regard to the Group’s performance in corporate responsibility.